An out and out bidding war has begun for one junior ASX oil and gas explorer that has had two takeover offers in the space of six months . Needless to say, that is significant news – this little company appears to be soliciting bigger and bigger offers for its onshore US acreage – and we are watching avidly just to see how high these offers go. The latest bid is a takeover offer from a joint venture partner in the US, valuing this company at $35 million – that’s 25% more than a previous offer made five months ago. Clearly, something’s going on here, so we thought we’d take a closer look at this stock to find out what’s under the hood. 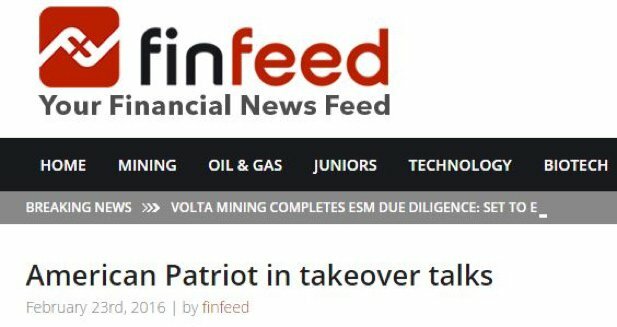 What we have here is an experienced management team which is adept at what is known in the oil game as a ‘real estate play’. This management team has had previous success implementing exactly the same business model. 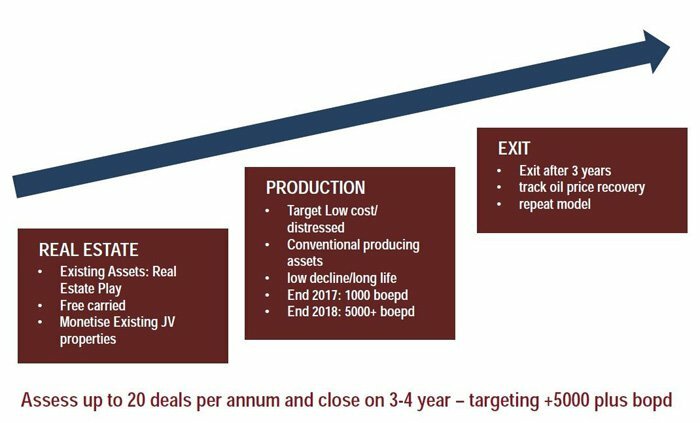 This play sees companies buy up leases, bring in JV partners to do all the initial work in de-risking the plays, and then looks to find a buyer for its stake based on the work. It’s a sweet deal if you can make it happen – and it appears that this company has somehow found the right formula. Still, this is an oil play and oil is always a volatile sector. It’s always a good idea to consult a professional before deciding whether or not to invest in this stock. The company recently completed an SPP which was fully subscribed raising over $6m – a big achievement in a tough oil market – clearly investors see something significant in this story. 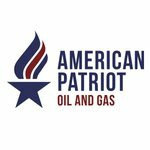 American Patriot Oil & Gas (ASX:AOW) has been up-front in its intentions ever since its IPO. Acquire acreage, attract a farm-in partner, have the farm in partner pay for the drilling, get the value of the asset up and sell out with a handsome profit for itself and its investors. It’s a simple play, right? It’s also one that the team at AOW has pulled off before. Several of the key players at AOW including current head of business development Kleo Hatziladas and non-executive chairman David Shaw were at Ambassador Oil and Gas in 2014. The game plan there was similar to what it’s pulling off in the US right now. Ambassador acquired a patch in the Cooper Basin (PEL 570 to be exact), and worked it up with joint venture partner New Standard Energy. It was being covered by New Standard on exploration costs, so aside from the acquisition cost for its 47.5% stake in the permit, Ambassador didn’t really pay a cent. Regardless, being in the Cooper Basin at that time meant you were fair game for a takeover. Drillsearch eventually won out from Magnum Hunter Resources, valuing Ambassador at $48 million. Now, we should mention at this point in time that Ambassador only had one asset. We’ll take a look at AOW’s assets in detail, but to reiterate the overarching play here, it is to farm out assets to get a free carry on exploration and then focus on an exit for the shareholder. AOW has already received two takeover offers in the space of six months – so that gives a fair indication that it is doing something right, and is gaining the right kind of attention. The key difference between 2014 and 2016 is that West Texas Intermediate crude was fetching around $100/bbl. in 2014 and it’s now fetching just over $30/bbl. Again, we’ll go into detail but let’s just do a bit of quick maths. The recent takeover bid from Running Foxes values the company at $35 million. Again, this is in a $30 oil price environment. If you assume $100 oil on the deal, then the takeover offer would theoretically be somewhere in the $116 million ballpark – well above the $48 million valuation Drillsearch gave Ambassador. So, how has AOW managed to pull that one off? 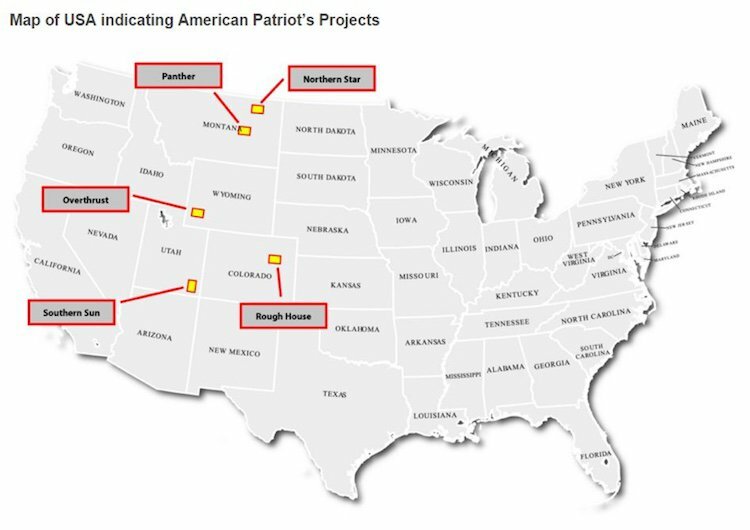 AOW has built a portfolio of boutique projects in some of the most promising oil regions in the US, with the play to get them to or near to production and then look for a partner to carry the weight of drilling. As you can see from the above map the projects are mostly focused on the Rocky Mountain basins region. The most advanced and biggest of the lot is the Northern Star project, but as we indicated above, it’s also recently done a deal to farm out the Rough House project down in Colorado. Interestingly, the $35 million deal from Running Foxes now means that AOW’s acreage has been priced at over $1,132 per acre. That’s not bad for a company which hasn’t actually done all that much drilling, and is indicative of this company’s nous for selecting high potential projects. Northern Star is the granddaddy of AOW’s portfolio, and is within cooee of the Lustre oil field in the region. The broader Lustre field is a conventional play, and has produced over 7 million barrels of oil since it was discovered by Exxon Corporation back in the 1980s. Back in 1986 the field became uneconomic when the oil price fell, so it is thought the conventional potential of the field hasn’t yet been fully tapped. In addition, the field currently produces from both the Mission Canyon and Ratcliff formations at 5500ft to 6000ft, with both considered candidates for horizontal completion – but AOW has focused primarily on the Ratcliff. Wells in the area which tapped those formations have produced at about 400 barrels of oil per day on initial production tests in recent times. What AOW did was take seismic around the area, and found that there were a number of conventional targets to follow up on, 17 in fact, alongside the unconventional potential offered up by Mission Canyon and Ratcliff. With both conventional and unconventional on the menu at Northern Star, what AOW did next was really quite savvy and showed again that this company has a team behind it which knows how to swing a deal. It, in effect, didn’t do just one farm out deal but two . The first deal that AOW did really set the company up and explains why these guys deliver for their shareholder. AOW completed a farm out with Great Western Oil and Gas. Great Western is a private Denver oil company owned by The Broe Group – overseen by a wealthy US billionaire Pat Broe. Now these are the kind of guys you want to partner with, and they would have bought into AOW’s acreage looking to build a project of significant value. Initial analysis of the acreage based on seismic, over 40 Exxon wells and recent wells indicate there is significant untapped resource potential left in the ground that Exxon left behind. Simply put, AOW is focused on using modern drilling techniques to go back in and unlock this resource whilst their partner Great Western pays for the drilling – a great arrangement. Accordingly, AOW has decided to focus on the unconventional potential of the leases with Great Western. Great Western has committed to free carry AOW on two horizontal wells, with another two in the offing. That means for two wells, AOW pays absolutely nothing. And as we mentioned above, there’s no cost cap on the deal, so if it happens to cost an arm and a leg to drill the wells, AOW could simply shrug its shoulders. In other free-carry deals, there could be a cost limit associated with it. For example, if it costs more than $15 million to drill the well because of technical difficulties then the junior partner would be on the hook for amounts above this according to its working interest. Plenty of juniors have been caught out on this before. The drilling of the first well under the deal started in February last year, with drilling, completion, and testing taking place throughout the year. AOW has previously estimated production of between 250 to 500 barrels of oil per day from the Ratcliff, for the well, but until a production test happens this is an estimate only. However, the initial testing has indicated that there is significant oil within the target formation , so that’s a good start anyhow. It wouldn’t be unreasonable to assume there will be more information on the fate of the first well within the current quarter, while AOW has pencilled in drilling and testing of a second horizontal well in the current quarter. Remember, AOW is free-carried on both wells, meaning that it doesn’t have to pay a thing. When AOW got its foot on the leases at Northern Star, it had just under 50,000 acres. However, it managed to swing a multiple party deal which both increased its exposure to more acreage and both conventional and unconventional potential. The deal with Anadarko meant the US company brought with it a nearby 12,000 acres which featured the Lustre and Midfork conventional fields. Again, these were the fields AOW was looking into anyhow. The deal with Anadarko was focused on the conventional potential of the acreage, with 17 prospects to follow up on in a conventional program. So far the Anadarko/AOW joint venture has drilled one well. That well, drilled back towards the back-end of 2014 produced at an initial rate of 508 barrels of oil per day, before settling back to 216bopd. With 17 prospects in the offing, you could imagine a production rate of over 3000bopd. AOW has also publicly stated that nearby wells tapping the same conventional targets have produced 200,000bbls each . However, 200,000 bbls for each well is a strong upside case for AOW’s project here, and there is no guarantee this will actually happen. So tread warily and seek professional advice if considering this stock for your portfolio. The Rough House project, down in Colorado, is one of four assets where AOW is thinking more conventional than unconventional. The great thing about vertical conventional wells is that they’re easier to drill and to produce from, but the downside is that they’re potentially lower-impact than their horizontal unconventional cousins. Rough House was also the project Running Foxes farmed into barely a month before lobbing in a takeover offer. As at Panther, Southern Sun, and Overthrust, the technical work done by AOW consisted mostly getting some low-cost seismic. Well, we say low-cost, but really that could say no cost. Again, what AOW has done here has taken a position near producing but essentially under-exploited conventional fields. In the case of Rough House, there are a slew of producing assets nearby. For example, Night Hawk Energy is producing around 2000 barrels of oil per day , while the Aloha Mula -1 well, on its own, had initial production of 1500bopd. The circle in red is the Rough House project. Running Foxes has form in the area, helping find the Arikaree Creek oil field, which was one of the original discoveries which led to the prolific Mississippi play in the Denver Julesburg Basin. You don’t need to know the full history of that play, but suffice to say Running Foxes has some form in the area. It’s agreed to a potential five well commitment, with AOW to be free carried for two of those wells. At this stage (if it’s not taken over, that is), AOW will retain a 30% working interest in the asset. The first well in the program is slated to start drilling in the third quarter. The most interesting thing about AOW, looking from the outside, is that it has received a total of two takeover offers within the last six months. In this time, despite some production testing at Northern Star, AOW only has a small amount of production on its books and that comes from Fort Peck, the conventional well drilled by Anadarko Minerals. Yet, two takeover offers with a combined value of over $50 million have been lobbed in. Suffice to say, something’s going on here. The first offer came in from a private oil veteran by the name of Edward Mike Davis. He’s somewhat of a cult figure in US oil circles and not a heck of a lot is actually known about him (aside from being notoriously grumpy ). He’s settled down in Nevada and is known as an oil speculator, taking assets and flipping them in short order. The fact he sees value in AOW means that he must think there’s potential for an even higher value sale in the future. He lobbed in an offer for $US20 million in cash ($A28 million) at the back-end of September, with the offer for the assets rather for the company itself. AOW knocked back the offer, calling it “opportunistic”. That being said though, it could be read as a validation of the market strategy AOW has employed. But, the sceptic inside all of us would say that’s simply an oil speculator having a punt. Speculating, if you will. But the appearance earlier this month of a second takeover at a $35 million value speaks louder volumes. In case you missed it, shortly after doing a deal to enter Rough House, Running Foxes decided to lob in a 22c per share deal in for AOW – valuing the company at $A35 million. This is just speculation on our part of course and there’s been no commentary in the marketplace on this, but given Running Foxes’ interest is in Rough House – does this mean it ascribes $35 million of value to that one project? If so – that’s a strong indicator of the value experienced oil and gas folks are seeing here, even at such an early stage. It’s an asset which hasn’t even been drilled yet and just happens to be in a good neighbourhood. That’s it. In any case, AOW has managed to procure two takeover bids without having any significant production on the books. That to us smacks of an astute real estate play. Given the track record of these guys with the bidding war with their previous company Ambassador and now two takeover bids for AOW – we are expecting another all-out bidding war to continue for this company. In the US in particular, smaller oil and gas companies engage in what’s known as a ‘real estate play’. This means that they don’t sit there, prove up an asset, get production, sort out sales pipelines and all that stuff companies usually do. Instead, what they do is do just enough work to make potential buyers think they’re onto something. This can take the form of seismic, petro physical assays, basically whatever’s needed. They enter leases with oil production happening around them. They then get some technical data suggesting to a potential buyer that there could be more oil under the leases for offer. AOW in this case has gone one step further and done some drilling, but again, this is of no cost to the company. What the play here is then is to work up the asset and then flip it, moving onto the next play much like a real estate market player would. Luckily even if a deal isn’t able to be done, costs for drilling don’t kick in for quite a while and by that stage it should have enough promise to be able to attract financing. But, all the signs point to either a total or partial takeover or asset deals. What AOW is doing is putting in a plan to make sure investors are able to exit the investment at multiples of the IPO price of 20 cents. The company IPO’ed back in 2014 so the 22c per share on offer from Running Foxes does go above the entry price. But of course, the oil price environment today is very different from the one back in 2014. According to NYMEX data, the oil price in the US was just below $100 at the time AOW entered the country and listed on the ASX. It’s now just above $30. That’s a 70% reduction in the time AOW listed to now. Now, if you reduce AOW’s entry price accordingly, it becomes 6c. So if you think about an oil-price adjusted entry price scenario, the 22c per share offer is more than a three times multiple. Of course, hypotheticals and realities are two very different beasts. But, the Running Foxes offer may not be the only offer on the table to come in. Perhaps the real question is, why are the offers coming in at all if the oil price is absolutely kaput? This is the big one – the question that keeps oil and gas companies and their investors awake at night, awaiting the latest dispatch from OPEC. After all, the whole oil slide of the past two years has largely had to do with the organisation. Long story short, there’s too much oil on the market to maintain current prices, but instead of cutting production back OPEC nations decided to keep on pumping the crude in an attempt to drive US shale drillers out of business. It’s worked – kind of, but not at a pace OPEC would have liked. So, now all parties are trying to seek a way out of $30 oil. Last week the nations of Saudi Arabia, Russia, and Qatar agreed to freeze production at January levels. It’s not a production cut, but it’s a start. The International Energy Agency, again last week, predicted oil would rise to $80/bbl by 2020 . It wasn’t the pace of growth that some were looking for, but its argument was that there wasn’t a chance in hell in a cut in production, but the rate of new oil hitting the market appeared to be slowing. So if the soothsayers are right, we could be on a path to almost treble to oil price within four years. However, we should stress that no one should take oil predictions as gospel – no one can truly predict with accuracy which way oil prices will go, and caution is advised if looking at investing in this space. If the predictions hold true though and we are about to enter into a phase of incremental growth – is this currently being priced into the offers AOW is getting for its assets? Or, could AOW simply sit tight for a couple of years and watch the oil price head north? We said before that AOW was trying to pull off a real estate play, but at the end of the day the value ascribed to the real estate is more about the sticky black stuff in the ground rather than a scenic view. The longer AOW goes about proving up its resource and drilling wells, the better position it will be in against a backdrop of possible rising oil prices. There’s a reason AOW’s had two takeover offers in six months: it’s simply putting together a great small-scale play. It managed to swing deals left and right, and it still has three projects it’s attempting to farm out. The takeover offers were largely centred on the potential of two of the projects. Remember, the company recently completed an SPP which was heavily oversubscribed raising over $6m – a significant achievement in a tough oil market and endorsement of the AOW strategy – clearly investors see something significant is this story, and this may well be just the start. With no considerable expenses on the horizon for a long time as their JV partners pay for the drilling, over $6m dollars in the bank, the prospect of more deals to come and a possible rise in the oil price AOW may elect to play the waiting game. After all, it only has a small amount of production in the books and it’s gotten two takeover offers.